1) Dry or Wet Steam Upholstery Extraction capabilities!!! 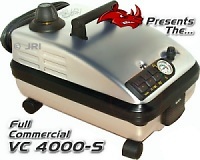 2) Hot Soap & Hot Water Injection 100% Adjustable at any PSI on demand! 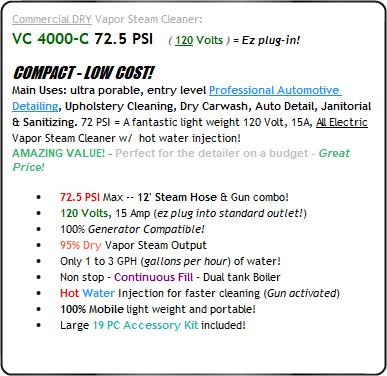 3) High Volume 145 PSI, 95% Dry Vapor Steam, 100% Adjustable any PSI! 4) EZ Continuous Refill, dual tank Technology! Refill even while steaming! * Industrial Power 95% Dry Super heated Vapor Steam Cleaner Output! 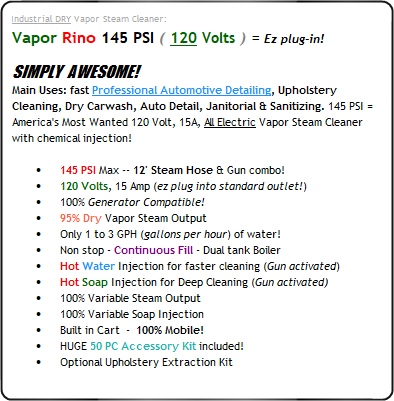 * Incredible 145 PSI / 10 Bar of Maximum Vapor Steam Power! * Ultra portable, locking wheels, collapsible handle. * Massive 50 pc. Accessory Kit INCLUDED Now! * 100% Adjustable Water & Soap Injection System at any PSI! * Uses ONLY 1 to 5 GPH = Gallons Per Hour of water! * Super Heated Steam Sanitizes as you clean! * Available in the turbo charged 230 Volt Version for max performance! Automotive Detailer on the run! * IDEAL FOR Mobile Automotive Detailing inside & out! * Tile & Grout Cleaning & Restoration & much more! have to provide a place to plug it in. you can plug this beautiful machine in. This makes the 120V ultra mobile. ready to go when you are!! Janitoral Work - Sanitize as you clean! 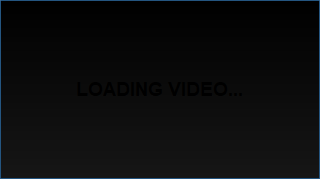 Steam is 100% eco friendly! Please note: NEVER EVER use steam on Humans, animals, or other creatures. It is used to sanitize hard & soft surfaces like metal, plastic, glass, wood, and fabrics. Help! What Can I use a Dry Vapor Steam System for? Bedbugs: Vapor Rino Steam Cleaners Kills Bed Bugs, Eggs & Larva on Contact! 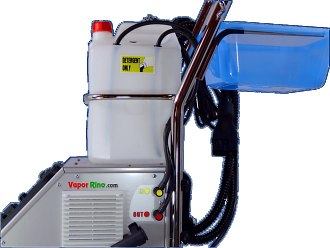 Lice: Vapor Rino's Super Heated Steam Cleaners Kills Lice, Their Eggs & Larva on Contact! Dust Mites: Vapor Rino's Super Heated Steam Cleaners Kills Dustmites, Their Eggs & Larva on Contact! Flees: Vapor Rino's Super Heated Steam Kills Flees, Their Eggs & Larva on Contact! Scabies: Vapor Rino's Super Heated Steam Kills Scabies, Their Eggs & Larva on Contact! Tight Spots: Steam can penetrate cracks and crevices like outlet covers, bolt holes and other places bedbug infestations can hide. Bar & Drain Flies: Kill drain flies and their larva by super heating your drains with our drain fly cone or the steam nozzle and a towel cover. 100% Environmentally Friendly!!! Safe, effective and easy to use. Steam works! No toxic chemicals or long term health risks. Rino Rocks! 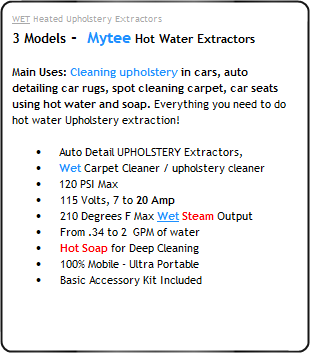 1) Dry or Wet Steam Upholstery Extraction capabilities! 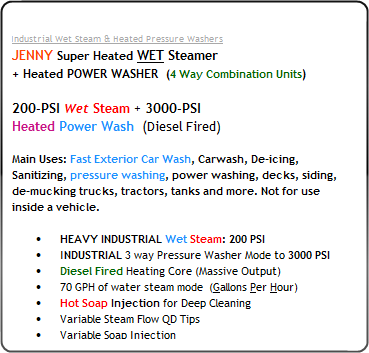 2) Hot Soap & Hot Water Injection on demand, any PSI! 3) High Volume 145 PSI, 95% Dry Vapor Steam! * Industrial Power 95% Dry Vapor Steam Cleaner Output! * Air cooled electronics for extreme durability! * Incredible 145 PSI / 10 Bar of Maximum Steam Power! * Available in the turbo charged 230 Volt Version! 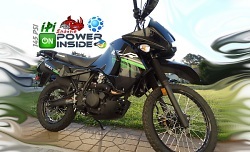 * 100% Generator Compatible for the mobile contractor & Automotive Detailer on the run! 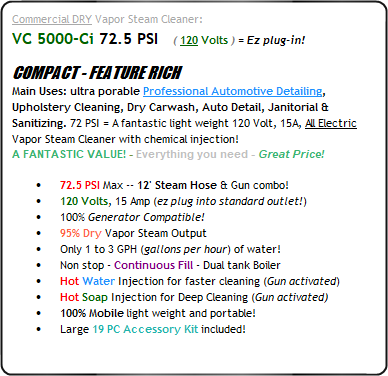 * Industrial Commercial Vapor Steam Cleaners work! NOW: 26 Foot Steam Hose Included! Great for Automotive Detailing & Janitorial work! Primary Benifit = Twice as Powerful! Primary Benifit = Easy to Plug in! Pressure Washer VS Vapor Rino Carwash! 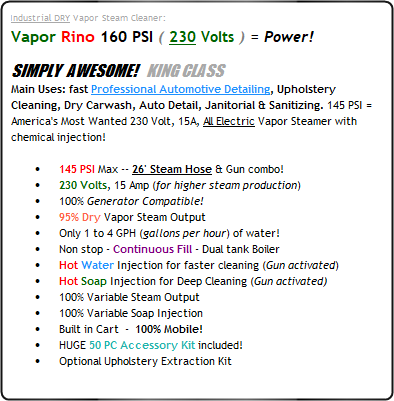 NEW: Vapor Rino Car Wash OR Wet Power Washing? Part of or Red truck mini series. See TIME TEST cleaning with a common wet pressure washer on one side of the truck and watch us demo a Vapor Steam Cleaner dry car wash on the other side / Automotive Detailing made easy. In this video we will weigh the pros, the cons and see in real time how long it takes. LEARN HOW to wash your customers car with ZERO water hitting the ground. This leaves your customers with a clean driveway and you with a great reputation. Get more drive by work as people see you working with our Commercial Steam Cleaner! NOW: FREE 26 Foot Steam Hose INCLUDED! Call for more information on getting a Vapor Rino® in your country!